A heap is created when a powder is poured onto a surface. It is widely known that both the heap shape and the repose angle strongly rely on grain properties. Specifically, a non-cohesive powder forms a regular conical heap, while a cohesive powder forms an irregular heap. 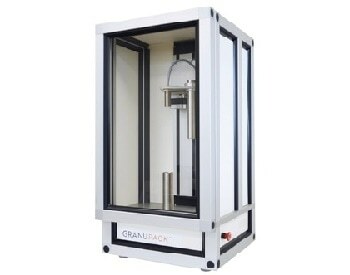 Therefore, an accurate measurement of the heap shape offers useful information about the physical properties of the powder sample. 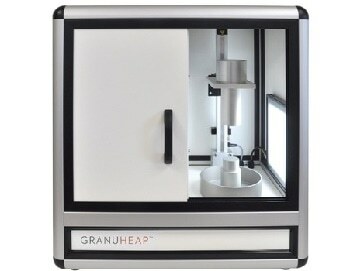 The GranuHeap instrument is an automated heap shape measurement technique predicated on image processing and analysis. A powder heap is formed on a cylindrical support with an initialization tube. 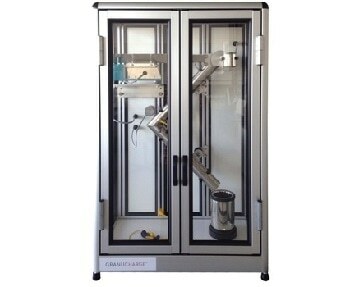 The tube goes up at the constant speed after manual filling of the initialization tube with a fixed volume of powder. 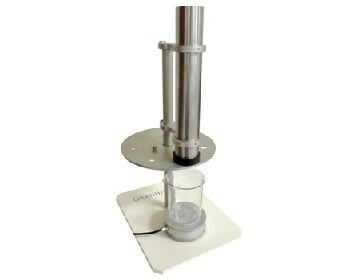 Thus, the powder is flowing from the tube to create a heap on the cylindrical support. Different heap projections corresponding to different heap orientations are obtained through a controlled rotation of the support. The position of the air/powder interface is determined by a custom image recognition algorithm. The repose angle is the angle of the isosceles triangle that has the same surface like the projected image of the powder heap. This isosceles triangle matches with the perfect cohesiveness heap shape. The repose angle is calculated for each image, that is, for each heap orientation, and then an averaged value is calculated. Generally, the powder flowability will be better if the repose angle is lower. The deviation between the isosceles triangular heap and the real heap interface offers the static cohesive index, which is calculated for each image, that is, for each heap orientation. For a non-cohesive powder, this static cohesive index is approximately zero and increases when the powder’s cohesive forces strengthen. 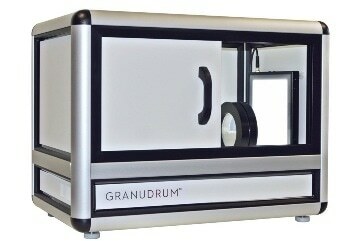 Supplied with intuitive software, both variance and average are easily accessible and enables the comparison of results. Accessibility is protected by passwords. All data and pictures are automatically collected and stored for post-processing. Data transfer is simple and reports can be automatically generated.